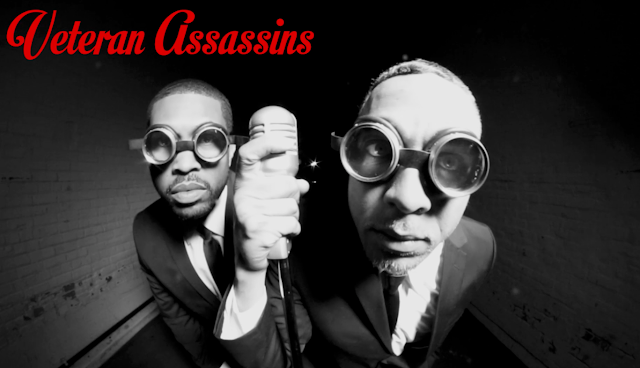 Los Angeles transplants (Greensboro, NC natives), Veteran Assassins, is a HipHop duo comprised of solo artists Veteran Eye and Ethemadassassin. Vet and E first broke ground together with their self titled album, Veteran Assassins, in 2010. Utilizing production from The Fakehunters (of Bordeaux, France) they wrote and recorded their first project in 6 days. In 2012, the duo vigilantes returned for a second go at it and released "Paint The Town Red". This cinematic LP was produced entirely by UK’s own, Edinburgh, Scotland’s SciFi Stu. In 2014 went VA took another by winning the Beatstars.com & HipHopDX Song Contest. Using beats provided by Havoc of Mobb Deep. Veteran Assassins along with R&B singer Nixon Payne then won the contest with “Watching You”.